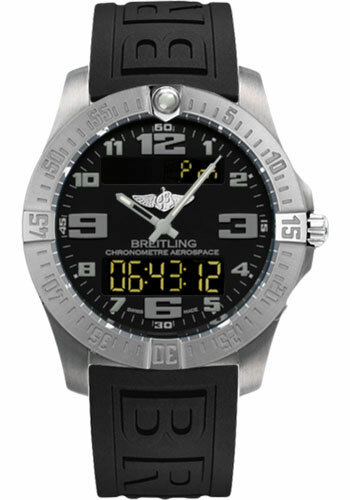 43mm satin finish titanium case, screwed in back, non screw-locked crown with two gaskets and integrated pushpiece, ratcheted unidirectional bezel, sapphire crystal with glareproof treatment on both sides, Volcano black dial, thermocompensated SuperQuartz electronic Breitling 79 movement with digital calendar with day and date programmed for 4 years, chronograph function, analog and 12/24 hr lcd digital display, display backlighting (nvg compatible) and eol indicator, black Diver Pro III strap with deployant buckle. Water resistant to 100 m (330 ft). 43mm satin finish titanium case, screwed in back, non screw-locked crown with two gaskets and integrated pushpiece, ratcheted unidirectional bezel, sapphire crystal with glareproof treatment on both sides, Volcano black dial, thermocompensated SuperQuartz electronic Breitling 79 movement with digital calendar with day and date programmed for 4 years, chronograph function, analog and 12/24 hr lcd digital display, display backlighting (nvg compatible) and eol indicator, blue Diver Pro III strap with deployant buckle. Water resistant to 100 m (330 ft).